The beauty of a matched system is a more even airflow, optimal energy efficiency and enhanced humidity control. Find just the right fan coil unit below to match your heat pump or air conditioner. All units come with all-aluminum coils in a sturdy, insulated galvanized cabinet and include a sloped drain pan to help control mold and bacteria build-up. The right fan coil matched with the right heat pump or air conditioner can even boost your SEER rating, giving your the optimal cooling efficiency to weather even the hottest Tampa Bay summers. Peak energy efficient performance when matched with a two-stage heat pump or air conditioner. Variable speed motor ensures even temperature throughout your home. Convenient wifi-enabled remote access via the Observer communicating control. 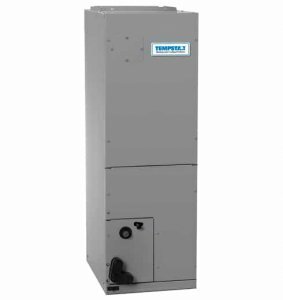 Match with a two-stage heat pump or air conditioner for even, energy efficient climate control. The Quietcomfort® fan coil variable speed motor ensures even temperature throughout your home. Thermostatic Expansion Valve (TXV) for efficient performance. The Quietcomfort® FXM4X multi-speed motor quietly delivers even temperature throughout your home. These fan coils provide the perfect match for your heat pump or air conditioner.